The next big stop on our route, India. A land known for it’s spicy food, beautiful and diverse culture, 100s of different languages and so much more! We had the opportunity to travel this amazing country and get a closer look. After the group had to split up in Iran because of visa issues, everyone was finally reunited in Bangalore. Furthermore, five new members were welcomed into the Spicyroad family. In the beginning it was a bit chaotic with so many people and we needed a while to get used to each other. Thankfully, the emotional meetings and hitchhiking together really helped us to bond and find our place in the group. We first spent some days in Bangalore to plan, sort out the work assignments and see the city before travelling towards Auroville after that. Hitchhiking from Bangalore to Tiruvannamalai (a beautiful temple town on the way to Auroville) was a very interesting and fun experience, especially with all the hitchhiking newbies. At the end of the day, everyone arrived alive. In Tiruvannamalai, we had to say goodbye to Eszter as she decided that she would explore India on her own. A few days later, we arrived in Auroville. We had heard so much about Auroville before we arrived, although in the end our experience worked out a bit different for us as we saw it more as a touristy and expensive place, rather than a spiritual village based on the concept of no money. On the other hand, we didn’t have enough time to see everything and after a good sleep in a tree house we came to see the beautiful side of Auroville. While staying in the Youth Center, we made some new friends and had a lot of fun volunteering. We even got to visit a local NGO called Wellpaper; a project in which women are employed to create incredible handicrafts out of old newspapers and plastic bags. Close to Auroville lies Sadhana Forest, an area used for a reforestation project. For one day we went to visit the area and we learned all about their work, the concept of reforestation and the community life in Sadhana. emka* decided to participate in this amazing project for a month and left Spicyroad in order to stay there. From the area around Puducherry we traveled west and passed Madurai on the way, a city which is home to one of the oldest hindu temples in the south. Eventually, we left the state of Tamil Nadu and entered Kerala, where we wanted to camp for the first time in India. Close to Munnar we found a nice camping spot and enjoyed our time sitting together around the bonfire, despite people warning us that it might be dangerous. The next morning we found out that it wasn’t actually dangerous – but illegal! Being chased away and with no place to stay, we got really lucky: one of our drivers from the previous day was the owner of a huge resort and offered us free accommodation there. We spent a lot of time walking through the forest and tea fields around the resort, bathing under waterfalls and star gazing together at night. It was one of the most peaceful and beautiful places in India! In Munnar, Will left us to go back to the UK and continue his studies. After he left, we headed south to the city of Kochi to do some work and sadly said goodbye to another member, Bin. 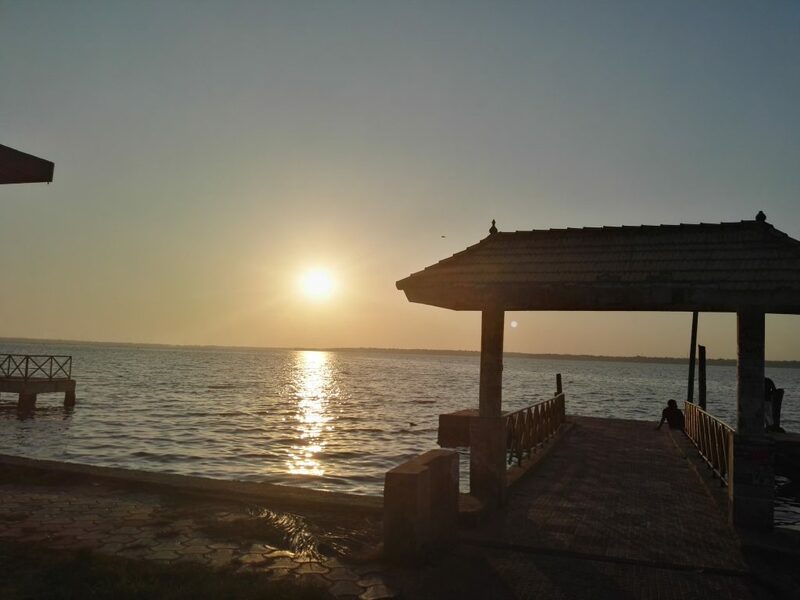 One of the highlights in south India was camping at Marari beach in Alappuzha! Three days of sun, ocean, midnight skinny dipping and sand finding itself in every place imaginable. In our next destination, Trivandrum, we were able to visit two of the major NGO’s in Kerala, Kudumbashree and the Sakhi Women’s Resource Center. These organizations help women by educating them about their rights and providing them with a place to share their situations and emotions. Kudumbashree focuses on creating smaller communities in the rural areas to educate and empower the local women. From Trivandrum, some of us took a day trip to beautiful Kanyakumari, the most southern tip of India, where three seas meet – the Indian Ocean, the Arabian Sea and the Bay Of Bengal. The next city to visit was Kollam, where we stayed with the lovely family of our host, Bruben. Some of us were taught the principles of pranic healing and together with his mother we cooked and learned some delicious new recipes! Aine left a bit earlier as she wanted to spend some more time in Goa before leaving India. A few days later, we caught up with her and also met a friend from Auroville again. At this point I have to say: what happens in Goa, stays in Goa! But be assured, it’s said to be the best party place in India for a reason! 😉 After some incredible and intense days of dancing and partying, it was time for Aine to leave and return home to the USA. From Goa, the rest of the group went back to Bangalore where Murad was able to set Spicyroad up with an interview with the Times Of India. All of us were super excited to be in one of the bigger Indian newspapers and to spread the idea of Spicyroad in such a big way. The time we spent in south India has shown us so many new things, some of them beautiful and others disturbing. By diving right into the culture, we also faced some of the stereotypes. Sometimes they don’t apply at all, but other times they have other sides to them which we didn’t know before. For example, India is said to be one of the most dangerous countries to hitchhike as a white person, especially a girl. Even among the local people, it is seen as dangerous and nearly impossible. However, being on the road taught us differently! It is more than possible to hitchhike and difficult to keep track of all the amazing people we meet on the way. On the other hand, we did also have encounters in which female members of our group got objectified, stared at and had to deal with inappropriate comments. It is also important to note however, that staring is much more socially acceptable in India and that we have experienced these kind of occurances in other countries. Thankfully, these situations are usually not really dangerous as we also travel in groups; it’s just very annoying to handle because of the position a woman has in the majority of Indian society. Nevertheless, most people we met were really nice and eager to help. From here we will continue traveling north to explore the rest of the country. At this point, we are aware of the fact that we will need more than one month to travel through India. But so far, every second has been worth it and we are looking forward to the next chapter of our journey! Looking back: Turkey Looking back: Iran Blanket ride in Bangalore Spicyroad’s Week in Review #15!